The acclaimed SBS documentary The Roman Empire in the First Century has finally arrived on DVD that gives one of the most in-depth accounts of the early Imperial Roman empire. After Rome was decimated by internal politics and civil war, Caesar Augustus was the first emperor to unify Rome and lead it into a golden age of prosperity and conquest. The series traces one of the most turbulent times of the Roman empire from the unification of Rome by Augustus to Caligula's madness and finally to Trajan's greatest conquest for the empire. The series is narrated by Sigourney Weaver who helps explore the culture and people of the Roman Empire from the everyday lives of its citizens to the majestic accounts of the emperors who declared themselves gods of Rome. The documentary is joined together by Historians who help recount the poems, stories and facts of this powerful empire with a variety of re-enactments to help draw the viewer into this compelling and thoughtful DVD. The video quality of The Roman Empire in the First Century is presented in an aspect ratio of 4:3.1 as it was originally aired on free to air television in the United States. The picture quality is outstanding, considering that it is a documentary made for television with vibrant colours and sharp pictures that helps you appreciate this ancient culture. The audio quality of the disc supports Dolby Digital 2.0 stereo with a compelling musical score Dana Kaproff that goes hand-in-hand with the visual aspect of this disc. The dialogue of the disc is extremely clear and audible. 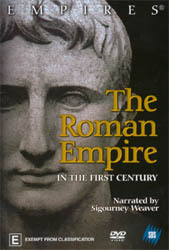 It is rare that a documentary contains extras and The Roman Empire in the First Century contains no extras whatsoever. The Roman Empire in the First Century is an entertaining DVD that I would recommend to any history buff, especially those with a love of the Roman Empire. Although the documentary does simplify the Roman Empire, it does make for good viewing with four episodes included in this collection.